This book is the Magnum, P.I. remake we all deserved. 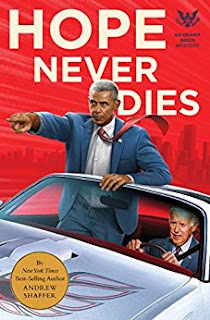 Andrew Shaffer has taken the Obama/Biden bromance meme and turned it into a fast-paced mystery with humor and heart in Hope Never Dies. After the 2016 election, Joe Biden feels that the world has forgotten him and moved on. That includes his BFF Barack Obama, who has been whooping it up with celebrities around the globe and not even kicking an occasional text to his former VP. But when Obama slips back into his life bringing news of a friend’s death, and the puzzling document found near his body that includes Biden’s address, Delaware’s favorite son has to know if this truly was an accident, or if it was something far more sinister. It’s time for mirrored shades, muscle cars, and getting down and dirty with the law. Joe Biden goes full-on Jim Rockford complete with bang-ups, bruises, tight scrapes and near-misses to find out what happened to his friend. Obama, along with Secret Service Steve, provides backup when Biden needs it most, but even in the midst of barfights, greasy spoon meals and a trip through the underbelly of the East Coast’s opioid drug trade, Smilin’ Joe can’t seem to crack a grin with his former Commander in Chief. Can this relationship be saved? You won’t know until the very end, and there’s plenty of twists and turns along the way. One thing is for sure: if you’re musclebound and into clean eating, don’t take an old man’s loaded hash browns. It doesn’t end well for you. I’ve been a fan of Andrew Shaffer’s work for years, but this book is some of his best work yet in terms of voice and tone. The language in every chapter is a spot-on homage to old school pulp detective novels and TV shows, and Shaffer has captured the public image of Biden so well, my inner narrator read the whole thing in his voice. If you’re looking for a fun, offbeat summer read, pick up Hope Never Dies. It’s a great escape revved up with weird like a Dodge Challenger. Hop in and go for a ride. A free ARC was provided to this reviewer.